Warm the water, stir in the sugar and yeast. Sift the flours and salt in a large mixing bowl. Add the oil to the proofed yeast and pour the whole into the sifted flours. Stir and mix into a soft dough. Place the dough in an oiled bowl and allow to rise to double its size - about 1 hour. Using extra flour as necessary, roll out the dough into a rectangle 20" by 12". 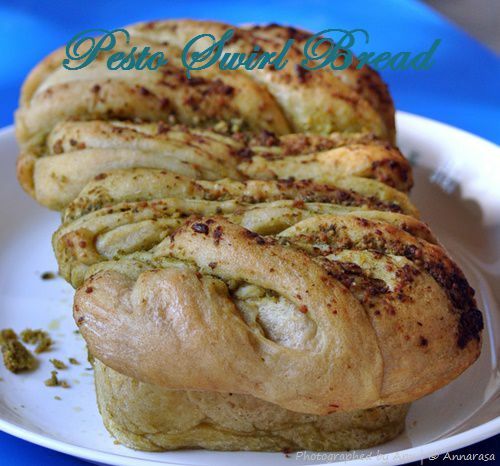 Slather the pesto onto the rolled out dough covering entire surface leaving 1/2" on all sides. Tightly roll the dough starting one of the shorter sides. Pinch ends to seal. Using a sharp knife, cut the dough down the middle, braid. Place the braid in a prepared loaf pan. Aloow to double, about 25 minutes. Bake in a preheated oven at 350 F for about 40-50 minutes. Remove fromoven and cool completely before turning out from the pan.